Sam has been with West Lake Imports from the Beginning. 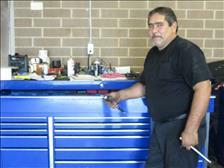 Sammy has over 30 years experiance ASE Certified mechanic and has been a Fixture in the denver area for over 30 years. Sammy is a Family man who has been married to Becky for over 30 years they have 2 sons who are also in the automotive indusrty. Sammy is a HUGE Part of West Lake Imports as he Prepares each and evey Vehicle that come through the shop ,and also takes care of any issues down the road. Sammys job is to get the Vehicles 100% before they are sold , then they go to the detail shop before they get advertised.. Sammy ,works very hard and allows West Lake Imports to put a Front Line Vehicle out there that we can be proud of. Kenny had a long career in motorsports making him the youngest Sports Car Champion at the age of 19 Winning SCCA's Formula Ford National Championship in 1988 as well as The Southern Pacific Champ. Kenny has had a long tenure in racing. He has gone from Coast to Coast racing open wheel dirt cars, USAC rookie of the year, Trans-Am, IMSA, Kelly American Series, NASCARs Southwest Tour, Craftsman Truck, Busch Grand National series. Although Never Securing a full time ride, He managed to make a career of Racing. Pat is from Canton, NC and wears many hats at West Lake Imports. She runs the Front Office as well as oversees the Warranty Department. Pat's experience speaks for itself with her 35 years in the Industry. She has worked for Sonic Automotive Group at Town & Country Toyota, Hendrick Automotive at Hendrick BMW, as well as 9 years with Mercedes-Benz, She has had experience with many car lines over the years. She brings a Wealth of Knowledge to West Lake Imports and If you buy from West Lake Imports Chances are you will work with Pat at some point as she oversees the title work and the Extended Warranty that we offer. 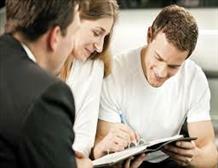 She will help you with scheduling service or repairs to help you learn about how to keep your car running properly. Dave is a Charlotte, NC native. He resides in Cornelius and enjoys Life on the Lake. Dave has over 50 years in the automotive industry. 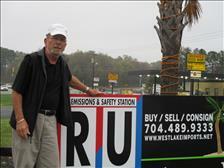 He has owned several different businesses ranging from Automotive Parts to Automotive Repair. Dave has a wide range of technical schooling from CPCC, ASE Certified, AC Delco Technical Institute, and the NC Automotive Wholesalers Association. Dave brings a huge range of knowledge to West Lake Imports and is a great compliment to our business. He helps oversee West Lake Service Department, where each car goes through a 125 point inspection in our shop prior to the NC State Inspection. Bianka's Favorite Past Time is Barking at the Horses at Home, and Playing with her BFF Bingo another Shepard. From the moment you step on our lot until the time you drive away in your next car, your buying experience with West Lake Imports is our number one priority. We encourage you to use the expertise and resources of our sales staff; they are here to help you find the right car at the right price. Call us today at 704 489 9333 to schedule your test drive!